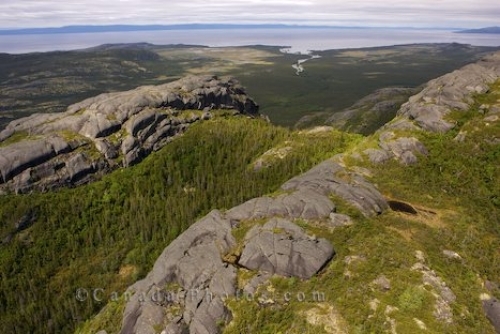 From atop the Mealy Mountains, the view is incredible of the Southern Labrador landscape made up of rocks, greenery, creeks, rivers and large bodies of water. Massive rock formations blanketed with green vegetation amongst the forest trees makes up the beautiful landscape of the Mealy Mountains in Southern Labrador in Newfoundland Labrador, Canada. The scenery from this viewpoint atop the Mealy Mountains is stunning as you can see for miles in every direction. Rocky landscape of the Mealy Mountains in the wilderness of Southern Labrador, Labrador, Newfoundland Labrador, Canada. Picture of the fascinating rocky landscape and greenery of the Mealy Mountains in Southern Labrador, Canada.